Fan Nickname: The terms "Inner Senshi", "Outer Senshi," and "Asteroid Senshi." None of them appear in canon, though some are derived from terms that do appear. The Inners are given the title "The Four Soldiers of the Guardian Gods" (四守護神の戦士, Yon Shūgoshin no Senshi), although this is very rarely used. The Outers are given the title "Outer Solar System Warriors" (外部太陽系戦士, Gaibu Taiyōkei Senshi), and use this name to refer to themselves in the anime as well. The Musicals use Naibu Taiyōkei yon Senshi ("Inner Solar System four Warriors") and Gaibu Taiyōkei yon Senshi ("outer solar system four warriors"), but these do not appear in any other media. 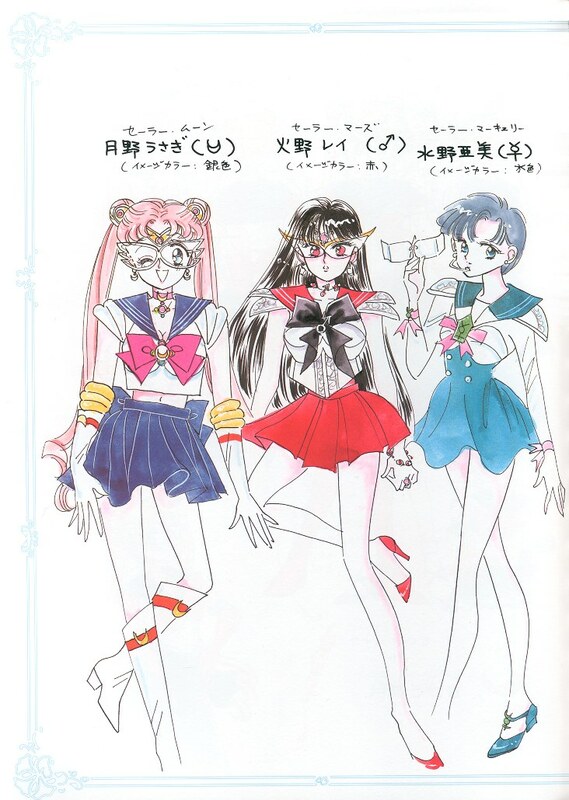 The last group is simply known as the Sailor Quartet in canon. It should be noted that the term "Inner Senshi" is derived from the shortened form of the Second Group's name (Outer Senshi), not the musicals. Thanks to Jupiter's inclusion in the "Inner Senshi", many fans often think the producers "screwed up" by including an outer planet as an "Inner" Senshi. Hey, It's That Voice! : Sailor Moon is... Misato Katsuragi? For that matter... Sailor Uranus is Shinji? Keep Circulating the Tapes: At one point, almost the entire series was available in the States: ADV released the first two seasons uncut and in Japanese (the sets were only missing Episode 67), and Pioneer/Geneon released S and Super S in both dubbed and uncut forms; they also handled the release of the three films (also in dubbed and uncut forms). However, Toei eventually revoked all international licenses for the show, and famously refused to license it to any one (until 2010; see below). It should also be noted that, despite fan interest, the Sailor Stars season was never released in the States. In 2010, Toei licensed a fully remastered version of the show in Italy, where it will begin airing in the fall; this news spread like wildfire, leading to hopes of the show eventually being relicensed. FUNimation has expressed on numerous occasions that they are interested in re-licensing Sailor Moon and even accidentally included it on a survey of properties fans could vote on for licensing. It's also re-airing in China as of August 13, 2010. No Export for You: Hi there, Sailor Stars. The anime got a luxury remasted DVD release that has yet to leave Japan. All R1 DV Ds of the show remain out of print and while the show is finally starting to appear overseas again, Toei is only licensing the rights to air the old 90s dubs and not licenses for new dubs. The anime is still completely MIA in the United States, with complexities over the rights providing a massive hurdle. FUNimation has mentioned on several occasions that they have tried to get the show, but have yet to succeed despite a strong working relationship with Toei. The Other Darrin: Tons in the North American Dub. Serena and Darien each went through three different voice actors, while Amy, Raye, Mina, Rini, and Pluto had two each (though Raye's second VA, Emilie Claire Barlow, only voiced her during the last 17 episodes of R before the first VA, Katie Griffin, returned to voice her for the remainder of the dub. Barlow soon afterwards became the second VA for Mina). Basically, Lita was the only one of the main cast to never change a voice actor. On the Japanese side, Usagi was voiced by Kae Araki (who would later play Chibiusa) from #44-50, due to her regular VA, Kotono Mitsuishi, having to leave to get her appendix removed. What Could Have Been: A number of the early character concepts for the franchise were extremely different by the time the first issue of the manga and first episode of the anime came together. Originally, the five girls that form the original Sailor Team had unique outfits. And Sailor Moon's hair was pink. 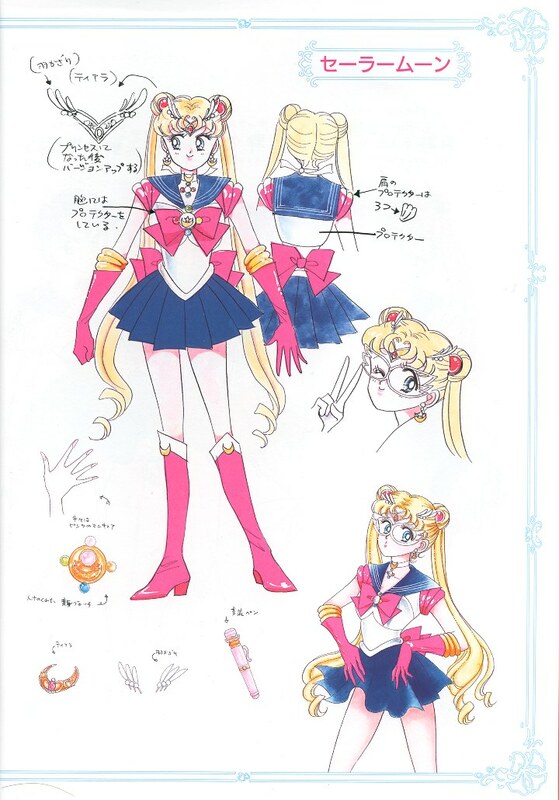 Other prototypes of Usagi had her with a cloak and a handgun. The Infinity art book includes an ad from Nakayoshi for "Bishoujo Senshi Sailor V" that has Usagi, but in Sailor V's uniform and teamed with Artemis. Readers of that issue must have been QUITE surprised by what they actually read. Ami changed the most in development. At first, Sailor Mercury was going to be Minako's friend Hikaru Sorano, who already looked a great deal like Ami. Later, Takeuchi decided to make her a unique character...a cyborg girl with an accelerator who would eventually die from losing one of her body parts. Her editor objected, so Ami became a fully human character with an intellect on a level that made her seem less human (though Takeuchi did eventually revisit elements of the cyborg idea with Hotaru). Makoto was originally a delinquent gang leader named Mamoru Chino. This was toned down to people mistaking Makoto for a delinquent despite her not actually being aggressive. Haruka and Michiru's original concept was a pair of performers in the real-world all-female Takarazuka Revue, of which Takeuchi was a big fan. This is also why they were portrayed as lovers. While their hobbies changed, their status as lovers stayed consistent. The infamous Toonmakers produced live-action/American animated pilot that Toei passed on in favor of the English dub by DiC Entertainment. Word of God: Only women can be Sailor Senshi. There cannot be a Sailor Earth because Tuxedo Mask has Earth's Sailor Crystal. This page was last edited on 20 September 2018, at 02:29.